It provides a cost efficient alternative compared to traditional electric incandescent lamp. A:Automatic turn on/off the lights by human induction: The Under Cabinet Lighting kit comes with a pir motion sensor switch When people enter into the sensing range, the light will turn on, during the delay time if motion detected, the delay time will reset and start a new delay time. If no further motion, the light will turn off. B: Directly turn on/off the lights by pressing the switch, The Under Cabinet Lighting comes with an on/off switch. 1) The PIR sensor switch only works in dark environment according to the default setting. 2) Do make sure there is no dust, oil or water on the surface of objects before installation to avoid falling off. 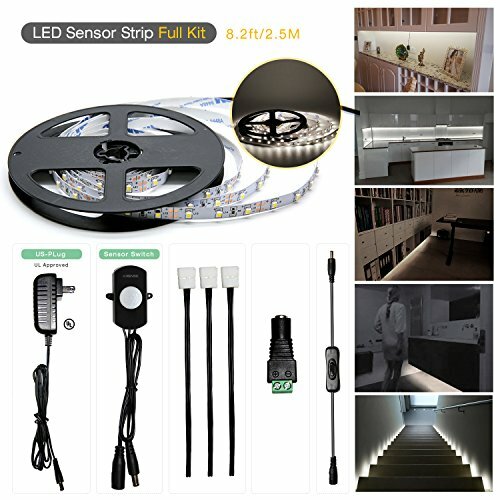 【MOTION ACTIVATED】 : 2.5m strip light controlled by pir motion sensor switch, Auto on or off by human induction. 【HIGH BRIGHTNESS LED】: While brightness for normal LED is 5-6 lm/LED, we adopt high brightness LED: 6-7lm/LED to ensure better lighting. 【SAFE AND LONG LIFE】: UL approved power supply and run on DC 12v, safe to children, reliable as Under Cabinet Lighting. 50000 hrs lifetime and 1 year satisfying warranty. 【EASY INSTALLATION】: Cuttable and connectable,with extension cables and connectors, you can easily DIY the length you want. Meanwhile, this light strip is ultra thin can fit perfectly on the narrow corners inside cabinets and around the wall. 【WIDE APPLICATION】: Most common application for LED Strip Light Kit is Cabinet, but you can also use it on Under Display stand lighting, TV wall lighting, Under Counter lighting ,Wardrobe lighting, Bookshelf lighting, Staircase lighting. If you have any questions about this product by Sensky, contact us by completing and submitting the form below. If you are looking for a specif part number, please include it with your message.